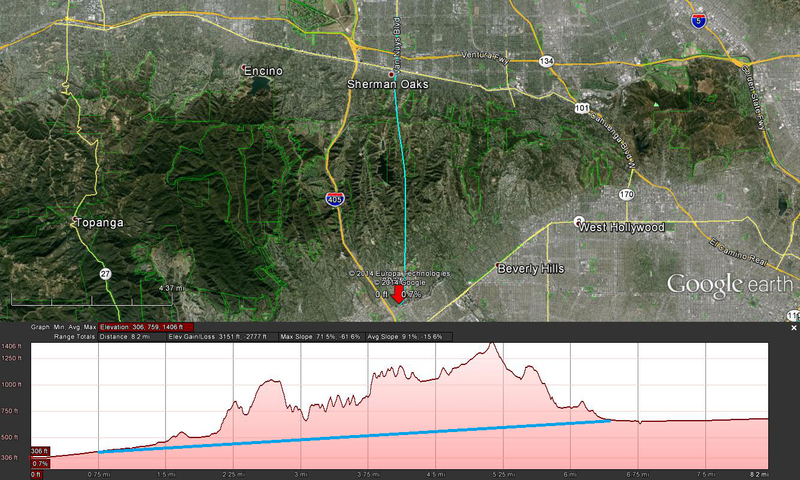 For an overview of transit between the Westside and the Valley, see Part 1. For a close-up look at LAX, see Part 2. The most critical part of a north-south transit line between the Westside and the Valley is Sepulveda Pass – the section that roughly parallels the 405 between Wilshire and Ventura Boulevards. Services on the Westside and in the Valley will probably end up having several branches using the pass, in order to maximize the usefulness of the pass segment. Due to the distance (about 7 miles) and engineering challenges, we’re probably only going to get one line through Sepulveda Pass in the foreseeable future. It’s critical that we get this segment right, get the most capacity for our money, and set it up to flexible enough to accommodate many services on both sides. What modes should the project serve? This will determine who can use the project, be it cars, buses, or trains. What should the project alignment be? This will determine what service patterns can be operated on either side of the pass and how they will relate to each other. Question 1 comes first, because the mode choice will affect the design criteria for the project alignment, such as curvature, grades, and ventilation. The concepts that have been floated publicly are all variations on a theme. They propose building a toll auto tunnel that would also provide lanes, perhaps dedicated, for transit. The project is often pitched as a candidate for a public-private partnership. If the alternative includes a tunnel, I don’t think auto lanes should be part of the plan, for reasons explained here. If HOT lanes are going to be part of the project, they should be converted from existing HOV lanes (or, if you insist on new lanes, new at-grade or elevated lanes, but there’s no spare capacity on the 405, the 10, and the 101 for new lanes to connect to anyway). That leaves bus and rail. The primary trade-off between bus and rail is implementation timeline versus capacity and operating costs. 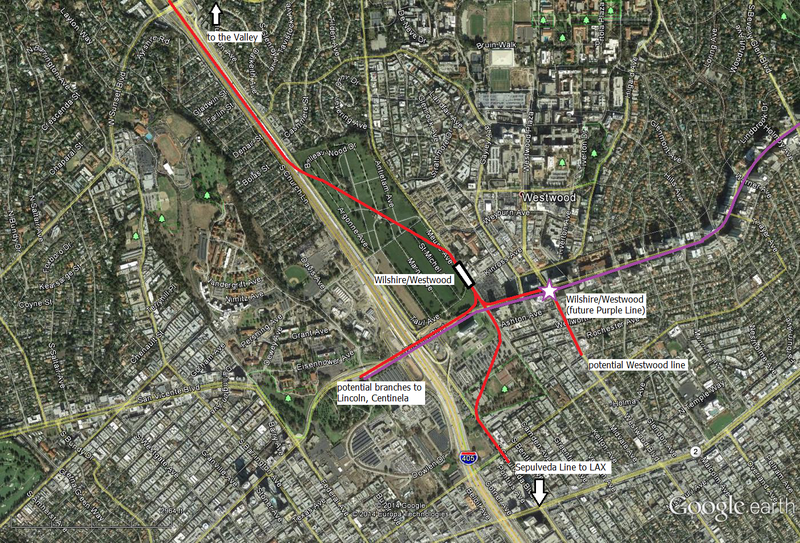 If the corridor is for buses, it can be used immediately by many bus services connecting all parts of the Valley and the Westside, while a rail link from Wilshire/Westwood to Sherman Oaks would be of limited use in isolation. Choosing rail would delay the usefulness of the project until feeder lines were built on both sides. However, as passenger volumes increase, which we would expect for a useful Sepulveda Pass project, rail offers higher capacity and lower operating costs. The first two options just seem underwhelming for the context. We’re not talking about the Gold Line from Azusa to Claremont or an improvement to an arterial corridor that’s got parallel arterials to be upgraded a mile away on either side. This is it – the one big project between the Westside and the Valley that we need to facilitate more growth between Sylmar and Long Beach. You don’t want it to end up like the MBTA Green Line, right? Some more serious numbers: in the post on capacity, we estimated about 5,000 pax/hr per direction for bus (standing load, 60 second headways) and 15,000-20,000 pax/hr per direction for LRT (standing load, 2 minute headways, 3 or 4 car trains). For comparison, the five lanes of the 405 (we’re ignoring the climbing lane and auxiliary lanes) have a capacity of about 12,000 veh/hr per direction. Obviously, the passenger capacity depends on how many people are in each car; assuming 1.2 pax/veh (not unreasonable for commuting), that’s 14,400 pax/hr per direction. That gives you an idea of the magnitudes of how many people can be moved by each mode. You can vary the assumptions as you like (double articulated buses, longer trains, higher occupancy in cars). Bus headways below 60 seconds are probably beyond the point where rail offers higher reliability and lower operating costs. The inclusion of bus would be mainly motivated by the desire to put the facility to use immediately, without waiting for long branch rail lines to be built. That puts a transit option with one lane in each direction in the same league as the existing 405, so maybe that’s enough. On the other hand, the relentless congestion on the 405 suggests there’s a crap ton of latent demand – in other words, a lot more people would be traveling through Sepulveda Pass if it were easier to do. We want this project to relieve the 405, but also to facilitate economic growth on the Westside and in the Valley. With that in mind, a large diameter tunnel with four tracks may be the way to go. To see why we might want a tunnel with two lanes or tracks in each direction, consider the effect of branching. Since Sepulveda Pass is a natural bottleneck, we should be serving several parallel north-south transit lines, bringing them together for a trunk through the pass and allowing transfers. In the opening post, we identified up to four corridors on each side to be served. With an operational headway of 2 minutes and one track in each direction, that’s 8 minute headways on the branches. This is short of Metro’s design criteria, which calls for operational headways of 5 minutes on LRT branches. With a large diameter tunnel and two tracks in each direction, operational headways of 4 minutes would be achievable on the branches. ory post, I defaulted to the assumption of a tunnel the whole way from Westwood to Sherman Oaks. Alon Levy rightly called that assumption out in the comments, prompting a look at some elevated and hybrid options. An elevated option is self-evidently going to follow the 405. This is both the best horizontal alignment and the best vertical alignment that does not involve a tunnel. From a technical standpoint, the critical section of the alignment is the approximately 1.5-mile long 5.5% grade on the north side of the pass. Light rail vehicles (LRVs) can handle short 5%-6% grades without issue; in fact, there are 5%-6% grades in many places on the new Expo Line for grade separations. However, I’m not sure if vehicle braking performance would suffer on such a long downgrade, and it might be difficult to support the required headways. Let’s assume 2 minute operational headway and 90 second design headway (Metro’s current design criteria for a trunk LRT line is 2.5 minutes operational and 100 seconds design). Safe braking distance, for signal design, must include (a) distance traveled during reaction time, (b) braking distance, and (c) a buffer between vehicles. If you’re using fixed signal blocks, the buffer might be the vehicle overhang; for Communications Based Train Control (CBTC), let’s use an assumed imprecision in the system’s knowledge of where the vehicle is located. Metro’s current design criteria specifies 9.8 seconds of reaction time. This might seem like a lot, but it has to cover equipment reaction time, operator reaction time, and brake build up. This value isn’t atypical in US practice. For braking, Metro specifies a distance of 0.733*S2/(B+0.2G), where S is speed, B is the braking rate (assumed to be 2.0 mphps), and G is the profile grade. Let’s assume 200’ for vehicle location imprecision (more precisely, 100’ for each train, with the worst possible combination of errors. For a design speed, let’s assume 60 mph. For safe braking, you need to assume the entry speed when braking starts is higher due to a combination of speedometer error and equipment tolerance. To keep things simple, let’s assume 65 mph. That yields a reaction distance of 934’ and a braking distance of 3441’, for a total of 4575’ (including the 200’ CBTC buffer). Using 0.2G underestimates the effect of gravity a little; if you calculate the braking distance based on a 2.0 mphps braking rate adjusted by the laws of motion, you’ll get 5029’. Okay, so that’s the separation you need from the rear of one train to the front of the train behind it. If you want the theoretical headway, you need the distance from the front of the train to the front of the train behind it. In other words, you have to add the length of the train. In this case, that’s four 90’ LRVs for 360’. If you have fixed signal blocks, you also need to add the length of one clear block of track, as shown below, but since we’re assuming CBTC, we’ll ignore that distance. That gives a total distance, based on Metro criteria, of 5389’. At 60 mph, that’s 61 seconds of travel time, essentially a 1 minute theoretical headway. Even if you assumed fixed signal blocks and added a clear signal block distance, it would seem that a 2 minute operational headway is within the realm of possibility. From a route planning perspective, the elevated alignment is not ideal at either end. At the south end, you end up at the 405 and Wilshire, west of the proposed Wilshire/Westwood station on the Westside Subway. It wouldn’t be too hard to deviate west to the Veterans Hospital; however, this is bound to be a low demand station. Wilshire/Westwood is a much better location for the transfer, because it will eliminate the need for many people on the north-south transit lines to transfer in the first place. It wouldn’t be too hard to get over to Veteran Av by crossing the cemetery (they’re the abutters least likely to complain). That makes the transfer reasonable, but still puts the stop at the very margin of UCLA and Westwood. 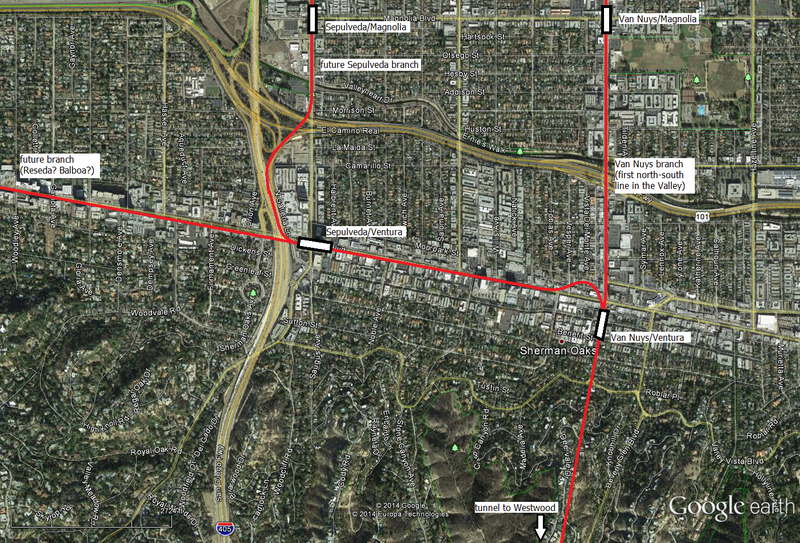 From there, the line would probably head back towards Sepulveda, but more on that another time. At the north end, the first stop would naturally fall at Sepulveda/Ventura. North of there, the line could hop over to Sepulveda Blvd at the 101 or at Burbank, and follow Sepulveda north through the Valley. Sepulveda is good corridor, and deserves a high quality transit service, but most of the interest in the Valley seems to prioritize Van Nuys over Sepulveda. Getting from Sepulveda to Van Nuys would require a one mile jog to the east, and the resulting zigzag would be bad route planning. 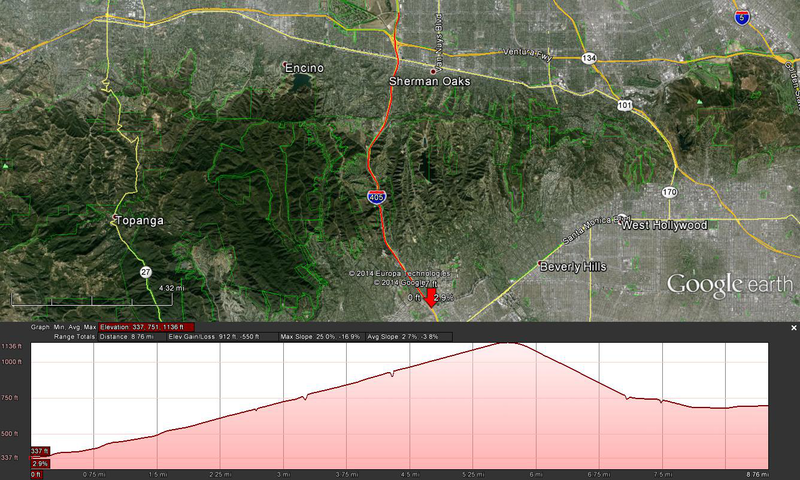 However, Sepulveda/Ventura is a decent node in its own right. A hybrid alignment would follow the same route as the elevated alignment from Wilshire to the 405 just north of the Sepulveda Blvd ramps. This would require about 3.5 miles of tunneling, just a little more than half of what the full tunnel would require. This alternative would save some money over the full tunnel alignment, because elevated construction is usually cheaper than tunneling. It would also allow the northern approach to be constructed at a much gentler grade, around 1.0%, than the 5.5% grade required by the elevated option, and greatly reduce the length of the 3.0% grade on the southern approach. From a route planning perspective, this alternative is also somewhere in between the elevated option and the full tunnel option. The southern end would suffer the same drawbacks as the elevated option, but the northern end would be in a better location, as described under the full tunnel option. 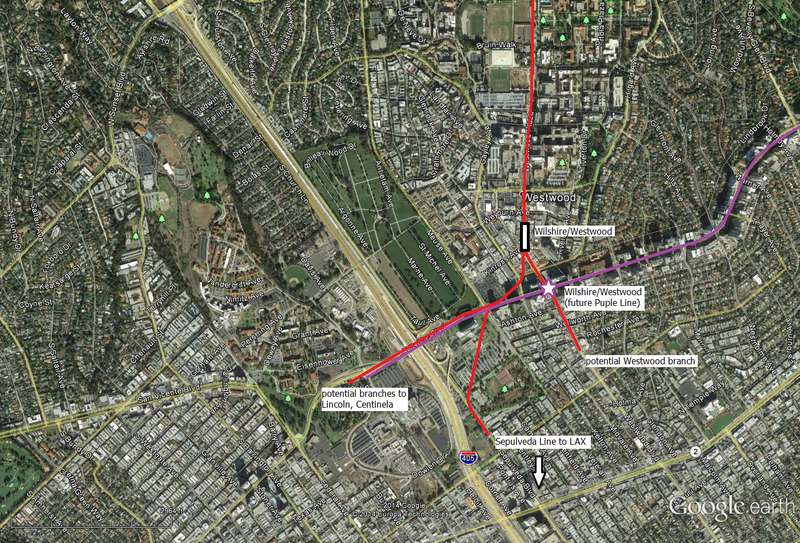 The tunnel alignment would follow the approximate route of the tunnel that has been proposed publicly, from Wilshire/Westwood to Ventura/Van Nuys. This route would be in tunnel the whole way. It might be possible to build some of the route at-grade through UCLA’s campus, but it’s probably not worth the effort to bring the line to the surface for such a short distance. This alternative would cost the most, but it would have the best track geometry, with a ruling grade of 1.0%. From a route planning perspective, it’s also the best option at both ends of the alignment. At the south end, it puts the Wilshire/Westwood stop in the right place for both transfers to the Purple Line and for local destinations at UCLA and Westwood. At the north end, it lines up perfectly with Van Nuys, the highest priority north-south corridor in the Valley, and yields reasonable geometry for additional branches to the west towards Sepulveda, Reseda, and Balboa. 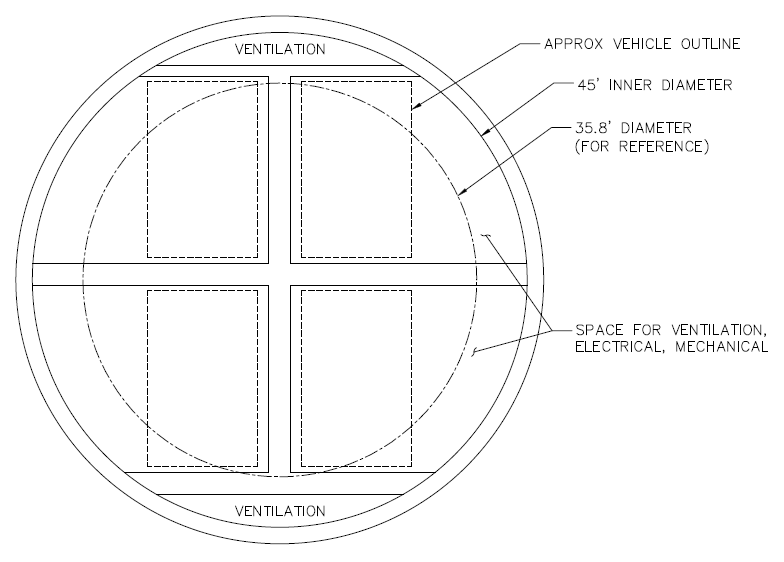 Assuming a tunnel is going to be part of the selected alternative, the cross section of the tunnel is the next question. With the exception of the Blue/Expo Line tunnel on Flower Street, all of the transit tunnels in LA were constructed with the same cross section, consisting of two single-track tunnel bores, connected every so often by emergency cross passages. The stations are center platforms located between the two bores. Four single-track bores, built in pairs either simultaneously or sequentially. In this option, you would probably build two tracks at the outset, leaving the next two tracks as a future project. Two two-track bores, again likely leaving the second set of tracks as a future project. Alon Levy pitched large diameter tunnel boring machines (TBMs) as money-savers because the station platforms can be located inside the bore; I’m not sure how much they’d save for an LA-type station, relative to the costs of the additional excavation. However, I think a large diameter TBM might make sense for the Sepulveda Pass project for different reasons. For one thing, when you do two single-track tunnels, you have to make a decision about how many TBMs to buy. Do you buy two TBMs, at considerable up-front capital expense, and allow both bores to proceed simultaneously? Or do you buy one TBM, and bore each tunnel sequentially, paying the price of a longer construction schedule? Using a larger diameter tunnel means buying fewer TBMs and a shorter construction process. Personally, I like the idea of one four-track bore with two tracks on each level. One level could be used for rail right from the outset, with the other level used for express bus services between the Valley and the Westside. In the future, the bus level could be converted to rail if needed for capacity. The advantages in time and cost are many: construction of launching pits is only needed once, the full capacity is available after completing one bore, working near an active transit line is avoided, and labor costs are reduced by minimizing complexity and shortening the duration of construction. This approach also avoids the tendency of future capacity improvements to remain forever in the future. Some recent examples of large diameter tunnels include the M30 freeway in Madrid (inner diameter 44.13’), Line 9 in Barcelona (inner diameter 35.8’), and the Alaskan Way tunnel in Seattle (diameter 56’). The TBM in Seattle is, of course, currently broken down, but don’t let their crummy execution sour you on the concept of a TBM that large. Barcelona Line 9 was apparently built to be just large enough for a four-track section, to allow crossovers between stations, but that seems like a really tight section for four tracks. On the other hand, 56’ would probably overdo it and result in high costs for the launching pits and excavation. The space to the sides of the tracks would accommodate electrical and mechanical systems, emergency egress, and ventilation as needed. For an overview of large diameter tunnel costs, see this post on long freeway tunnels. 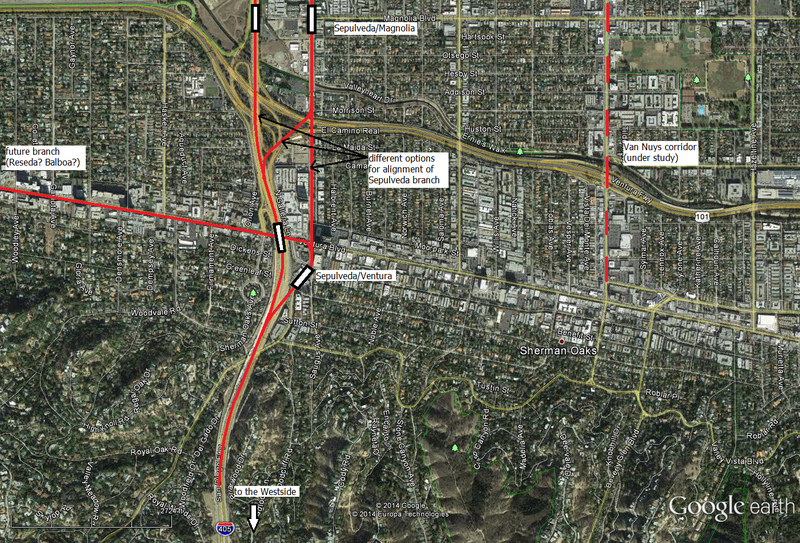 There are several feasible alignments and mode alternatives through Sepulveda Pass. While an elevated facility following the 405 is theoretically cheaper, it may be less so in this case because it would have to be constructed over and around an active freeway. The hybrid and full tunnel options offer better routes, and might be worth the trouble, especially if a high capacity tunnel can be built in one bore (and we can reign in US tunneling costs a little). An option that has provisions for both bus and rail will allow higher utilization of the tunnel from the beginning, without needing to wait for all the branch rail lines to be finished.